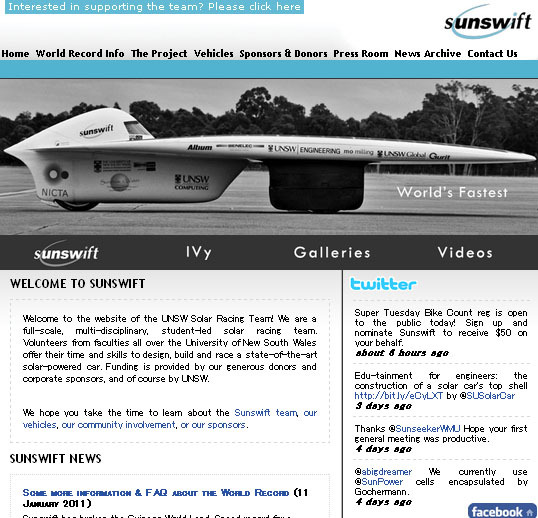 " UNSW’s Sunswift solar car has lived up to its name, smashing a Guinness World Record to become the world's fastest solar vehicle. The car, designed and built by UNSW students, smashed the world solar car speed record at the HMAS Albatross navy base airstrip in Nowra, travelling at more than 88km/h. The speed was significantly faster than the previous record of 79km/h. The milestone is for cars powered exclusively by silicon solar cells. IVy normally uses its cells to charge a 25kg battery, but this was removed for the record attempt. IVy produces about 1200 watts - the same power it takes to run a toaster. The car hit a top speed of 103km/h during the 3000km Global Green Challenge race from Darwin to Adelaide in 2009, in which the team won their category.